We’re always seeking to push the boundaries of what’s possible with Moodle and stay abreast of the latest e-learning trends. With the Moodle core as a base, our Moodle development team create innovative solutions to extend the functionality of the platform further. Whatever you’re looking to achieve with e-learning, our expert Moodle developers have got the knowhow to take your idea from the drawing board to reality. Why not get in touch to chat with one of the team about your Moodle development requirements? Our Moodle developers are backed up by our team of in-house e-learning consultants, designers and user experience (UX) experts. Our team members have been working with Moodle, and even contributing plugins and advice to the Moodle community, for an average of 10+ years. We’ve supported businesses, educatin providers, not-for-profits and public sector organisations worldide to benefit from the open source freedom and flexibility that comes with using Moodle. We’re always happy to speak to fellow Moodlers about any idea, large or small, which brings something extra to the Moodle platform, or extends its functionality in some way. Every project starts with a consultation, which allows us to unpick your project into its individual parts, and work out the likely timescales, costs and requirements involved in realising the brief. Contact us for a learning platform and Moodle consultation! Whatever your idea, there’s usually more than one way of bringing it to life. Our experienced team of developers are expert in finding innovative and efficient solutions to the most complex problems – it’s what we thrive on. In collaboration with you, we’ll draw up a solution design which incorporates each thread of your brief and lays out how the final product might look. Contact us to discuss e-learning solution design! With the final concept agreed, we’ll weave together all the necessary elements into a specification document which outlines each detail of the build. We’ll then create a working mockup ready for initial testing by the Titus team to ensure we haven’t missed a stitch. Our agile development process allows us to provide you with regular updates on the build process, and adapt to any unforeseen issues which may occur along the way. Contact us to discuss your learning platform specifications! Once you’re happy with the working build, it’s time to involve a wider audience in the testing process. As well as identifying any remaining issues, this stage is vital for assessing the user experience and usability. Beyond the development side, we’ll help you put together a beta testing programme, provide training on how to manage test groups and collate feedback effectively and review the test data as a whole. This will then feed into the final stages of bug fixing and adjustments to arrive at a finished product ready for launch. Contact us to discuss Moodle development and testing! With testing complete, it’s time for the big unveiling as you put your finished product live – always the most exciting part of the project. As well as supporting you with technical aspects of roll-out, we offer a helping hand when it comes to promoting your new platform, training staff, and ensuring your target users are engaged and excited about the launch. Contact us to discuss your rollout and implementation! Of course, launch day is just the start. Once your new product is out in the world, we’ll help you ensure it grows and adapts to a changing market. Whether that’s developing new features in response to user feedback, releasing security patches or version upgrades, or assisting with ongoing promotion we’ll provide proactive and informed assistance. 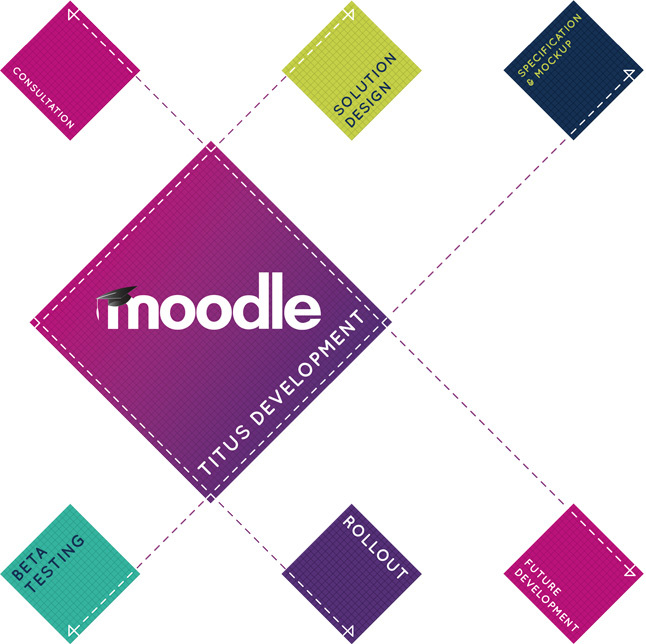 Contact us to discuss your Moodle development requirements! Why not get in touch to see how our Moodle consulting services can help you too?